Hongyu chowi – Convergent Evolution Or Did We Get It All Wrong? The invasion of the land by vertebrates, the evolution of the first four-legged land animals (Tetrapods), in the Late Devonian is regarded as one of the most significant periods in the history of the Chordates. Palaeontologists think that the first land animals with backbones, evolved from a type of lobe-finned fish belonging to the Class Sarcopterygii. Numerous fossils of Sarcopterygians, including several types of transitional forms have been discovered from Eusthenopteron to Panderichthys, through to Tiktaalik and onwards to the stem Tetrapods Acanthostega and Ichthyostega scientists have been able to piece together the evolutionary development of limbs and other terrestrial adaptations… or have they? A fossil from the Upper Devonian deposits of the Zhongning Formation in the Ningxia Hui autonomous region of central China just might have caused a few palaeontologists to take a step backwards. The newly described Hongyu chowi shows a combination of anatomical traits, some of which are found in more basal members of the Sarcopterygii, whilst other characteristics show an affinity to that group of Sarcopterygians that are believed to have been ancestral to the Tetrapods. This mix of anatomical features makes it difficult for scientists to place Hongyu chowi in the fishy family tree. An illustration of Hongyu chowi. This Devonian fish is believed to have been an ambush predator. 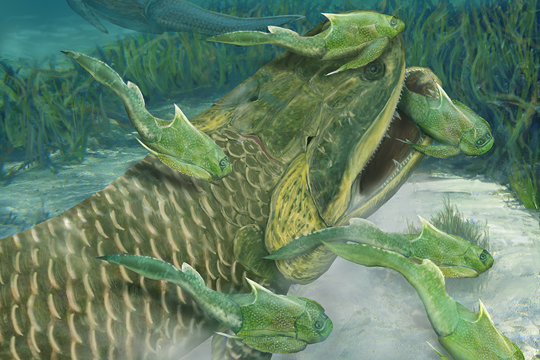 The picture above shows the 1.5 metre-long Hongyu chowi ambushing a group of Placoderms (Antiarchs). Writing in the academic journal “Nature Ecology & Evolution”, the researchers which include scientists from the Institute of Vertebrate Palaeontology and Palaeoanthropology (IVPP), and Uppsala University (Sweden), describe Hongyu as a predator. It probably hunted in a similar way to extant Wobbegong sharks (Orectolobus maculatus). These sharks, sometimes referred to as Carpet sharks, lie on the bottom and wait for small fish to come near them before they rapidly spring up and try to grab the startled fish in their over-sized mouths. The fossil material dates from approximately 370 million years ago, a time when the first Tetrapods were evolving. Hongyu chowi looks like a rhizodontid fish, a group of basal Sarcopterygians that are thought to have branched-off from the lobe-finned lineage of Sarcopterygians that led to the first land vertebrates. However, it has the same shoulders and gill cover supports seen in the Elpistostegalia (otherwise known as the Panderichthyida), an Order of Sarcopterygians that led to the Tetrapodomorpha, fish that had limbs capable of supporting them on land. The block which contained the fossil material (Hongyu chowi). H. chowi is a rhizodont that independently evolved the similar body characteristics to other distantly related Sarcopterygians making this fish an example of convergent evolution (unrelated animals develop in similar ways as they are exploiting similar niches or resources, such as the evolution of wings in both birds and bats). H. chowi is a rhizodont and subsequently, the Order Rhizodontida are more closely related to the Tetrapods and the Elpistostegalia (Panderichthyida) than previously thought. If this is the case, it suggests that there was a certain amount of independent evolution of similar features, because in a phylogenetic analysis, the Rhizodontida would be nested between two groups (Tetrapods and the Elpistostegalia/Panderichthyida) which share many characteristics, which brings into sharp focus the idea that these two groups had to evolve similar features independently.